“Caffeinated” is a zany and charming highly charged dance set to Philip Glass’s “Glasspiece #3.” The work was commissioned by New York University’s dance department and was recently expanded by Jaclyn Walsh, Keigwin’s regisseur, for a cast of 13 CWRU dancers that includes graduate students and undergraduate dance majors. Returning to the Mather Dance Center stage is “Bamboo Prayer,” a dance for five women that was commissioned by the Joyce Theater in New York where it premiered in 1998. Inspired by the beauty of bamboo, a plant abundant in Chen’s native Taiwan, the dance exudes the strength, resiliency and grace embodied in women. Chen was in residency at CWRU for one week to set the dance in the Fall of 2017. Last year marked the first time a group other than Chen’s New York based company performed the work. “Imagined Odyssey,” created through a collaborative project with CWRU’s Interactive Commons and Gary Galbraith, artistic director of the Department of Dance, is receiving its encore performance due to its success and popularity with our patrons. The groundbreaking, narrative-based technology work utilizes live holographic imagery featuring Microsoft’s HoloLens, an augmented reality holographic headset. 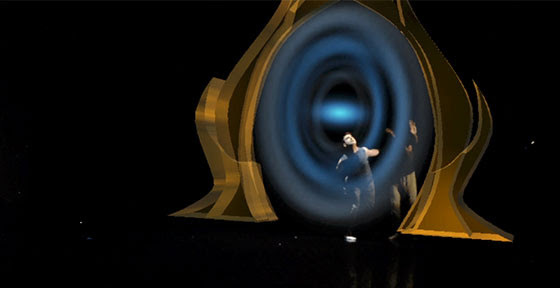 Members of the audience will wear HoloLens in order to watch the dancers and holograms move seamlessly on stage as the merging of choreography with holographic content and particles made entirely of light magically create the mysterious landscape of sets and props. These performances will again mark one of the largest numbers of people in the world to simultaneously experience a live holographic presentation using HoloLens. The unique collaboration draws upon the expertise of dancers, artists, illustrators, programmers, network engineers and more. Galbraith’s new three-sectioned untitled work is another in his long line of media-rich dance works. This new work set to haunting and intensely beautiful music finds Galbraith exploring responsive media with projection mapping in new ways to create colorful moving images projected onto dancers, the floor and set elements. All performances take place at Mather Dance Center, 11201 Bellflower Road, on the CWRU campus. Ticket reservations are highly recommended and should be reserved by calling (216) 368-5246 or online at dance.case/reservations. Tickets are also available at Mather Dance Center prior to each performance. General admission is $15, Senior and CWRU faculty/staff tickets are $10, student tickets are $7 (student discounts NOT available Nov. 17). Cash/check ONLY.